This summer it will be 5 years since the couple got married and their humanitarian foundation will also be 5 years. To mark that there has been organised a writing competition where the first prize is a visit to Africa given by the Crown Prince Couple. The competition is organised together with the department for education and knowledge. Mette-Marit will lead the jury. The paper should be about how one person can make a difference in your local community and in facing the challenges the world has today. It was the students at And&#248;ya School that had invited Haakon to hear about what is beeing done against powerty. Today Haakon will visit the big military rehearsal that takes place in Troms this week, "Cold Respons"
Does the article say what age group is eligible for the contest? Is it for school age children, etc.? It was the students at Andøya School that had invited Haakon to hear about what is beeing done against powerty. 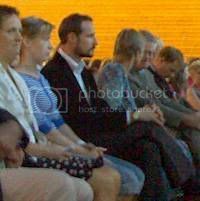 Will Mette-Marit join Haakon on some of these school visits? That's one of the advantages of the monarchy: the heir never needs to fight for his position like politicians have to, but is groomed from his early youth to fit in with the position. If the monarch has the right personality on top of it all, he is far better suited in my opinion than many politicians. At the moment it appears as if the heirs are quite well suited for the job. And if they decide against it (like it was said that it could have happened with prince Frederick) then I think nobody will hold it against them. They'd loose their "public" privileges but keep of course those inherited from their family which seems okay to me. 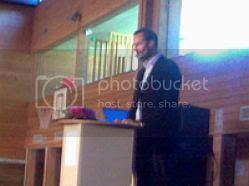 Crown Prince Haakon of Norway during his visit to he Nansen School in Lillehammer, Norway, April 19, 2007. The Crown Prince attended an international conference with Serbs and Bosnians at the school. Thanks for the pics dazzling and Larzen! Haakon seems to be doing alot of duties here lately! Which is good, b/c we get to see pics of him! Do we know if and when we'll see pics of the whole family? A definite time when we'll see all of them will be May 17 - the national day. That's right National day is coming up. Can hardly wait. This has sure been a fast paced and enjoyable last couple of weeks watching these different families with babies and Norway's state visit. But it looks like we have a lot more to look forward to right around the corner. Before you know it July will be here and the celebrations for Sonja's b-day will take place. Nowegianne do you know if any networks broadcast a live feed of the family on the steps so I can watch at home? The Crown Prince is giving a lecture on development issues at Sogndal high school (it's the same lecture he's been giving at other schools), on June 7. The lecture he's giving is called "To make a difference". 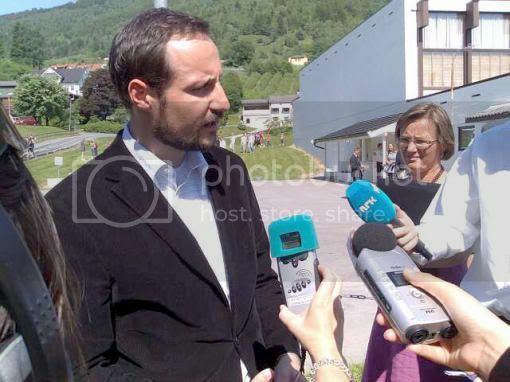 The Crown Prince has been visiting a high school in Sogn and Fjordane county today to speak about the division of resources and environment issues with the students. Here are some photos from that. Not all of them in good quality, because they have been taken as MMS photos. He just keeps getting better looking and better looking.